Made from the best grade, tightly woven, 2-ply yarn, all-cotton duck the same stuff they make top quality, insulated coveralls from. Solvent- and oil-proof nylon thread used throughout. Everything heavily reinforced with seams rolled, double stitched and finished, all corners and stress points bar-tacked for strength. Machine washes and dries without edges curling or losing shape. Top-quality, custom-made, above-the-knees apron. Hook-and-loop closure on the neck strap lets you adjust the bib for maximum coverage and the length to match wearer s height. Centered top pocket is sewn solidly to the apron so it can t swing and has a separate slot for pens, pencils, or a mike. Roomy, double, lower pockets. SPECS: 28½" (72.4cm) long. 2" (63.5cm) wide. Pockets: Top - 4-1⁄8" (10.5cm) wide x 4¼" (12cm) high with pencil slot. Lower (x2) - 6¾" (17.1cm) wide x 6¼" (15.9cm) high. Ties: each 27½" (69.8cm) long. Neck strap: 21¾" (55.2cm) long. Laget av beste karakteren, tettvevd, 2-trådet garn, dukke alle bomull de samme tingene de gjør topp kvalitet, isolerte coveralls fra. Løsemiddel - og olje-bevis nylon tråd brukt gjennom. Alt betydelig forsterket med sømmer rullet, dobbel sydd og ferdig, alle hjørner og stress poeng bar-stiftet for styrke. Maskinen vasker og tørker uten kanter curling eller taper form. Topp kvalitet, skreddersydd, over-knærne forkle. Krok og loop lukking på halsen stroppen kan du justere bib maksimal dekning og hvor å matche bæreren s høyde. Midtstilt øverst på lommen er sydd solid til forkle slik at den kan t swing og har en egen plass for penner, blyanter eller en mike. Romslig, doble, lavere lommer. This rendition of the old style is the way to go. With the rings added back and the loop between the shoulders the apron and the long one with O-rings are much better designs that should never have been discontinued. Way to go Brownells and thanks for listening to the guys that keep your business going. The short one is handy to use at the sight-in bench for quick access to tools that normally clutter my shooting bench too. I really like this apron. I have my reloading room at work in an office that nobody is allowed into, they think it's storage ;) But I an dressed nicely and want to make sure I don't get oil or grease or flying brass cuttings all over myself - and this does the trick! It's great! Has nice pockets for my tools and pens and such and does a great job! Thanks! Just finished annual weapon inspections and cleaning for a mid sized PD (45 officers). Apron kept me clean and was comfortable for 8 hours a day for several weeks! 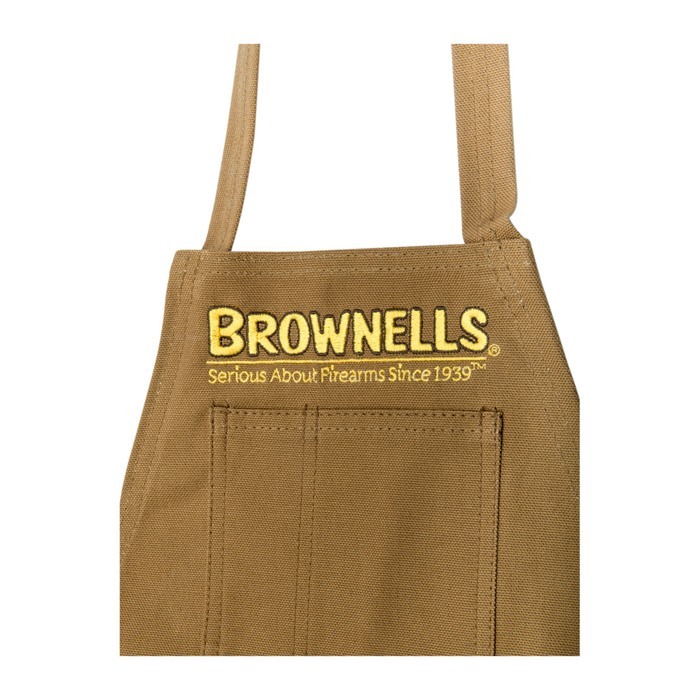 After searching the internet which led me to Brownells,I found the best apron that meets my needs.Very satisfied with the fit & quality. This was a great product, Why would you change it? My wife was impressed. 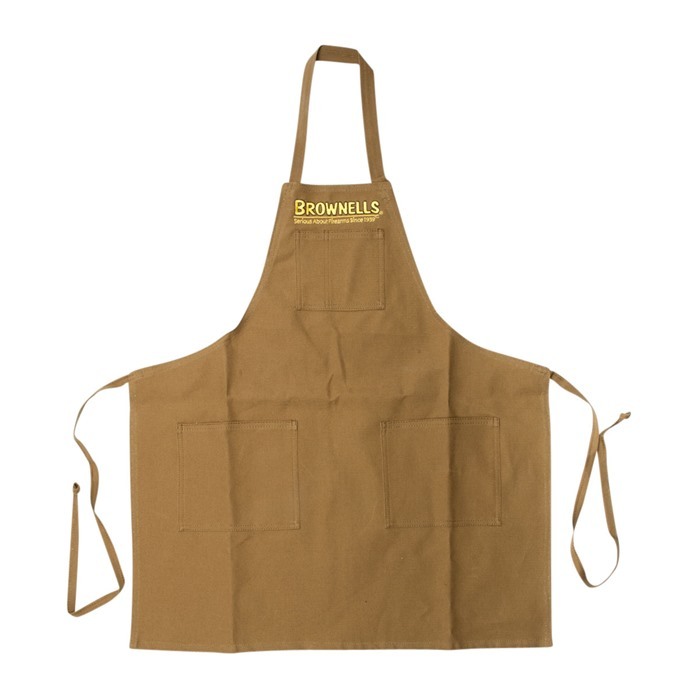 Says we will save money on Spray & Wash.
Brownell's should go back to the origional design ASAP.This model hangs the weight of the apron and tools on teh back of your neck instead of comfortably on the shoulders.Headaches and stiff necks always result from this design. This Gunsmith will have to go looking elsewhere or have some custom made for future use.Brownell's is great company with great people throughout but this change is for the worst.Hope they change back soon,I hate sending business to other Companies. I have one of the older style aprons with the metal rings and got a replacement of this new style some time back. The new one is uncomfortable after any length of time as it abraids the neck and puts the weight of any tools right smack on the back of your neck. As a frequent user of the old one I repaired it and gave the new one away. I have two of the older "D Ring" style and have worn them for everything from whelping puppies to working on automatic transmissions and when I can no longer repair them I will buy another brand rather than sew canvas by hand to make any of the new ones usable. A must for cleaning and general work on firearms. I love this design with the nice neck strap. Its comfortable and adjustable with hook and loop. Easy to put on without dealing with long straps. Most of my cleaning and work is done sitting down at a bench. The apron catches small parts that might roll off the bench. Short Shop Apron 050806109087 Laget av beste karakteren, tettvevd, 2-trådet garn, dukke alle bomull de samme tingene de gjør topp kvalitet, isolerte coveralls fra. Løsemiddel - og olje-bevis nylon tråd brukt gjennom. Alt betydelig forsterket med sømmer rullet, dobbel sydd og ferdig, alle hjørner og stress poeng bar-stiftet for styrke. Maskinen vasker og tørker uten kanter curling eller taper form. Topp kvalitet, skreddersydd, over-knærne forkle. Krok og loop lukking på halsen stroppen kan du justere bib maksimal dekning og hvor å matche bæreren s høyde. Midtstilt øverst på lommen er sydd solid til forkle slik at den kan t swing og har en egen plass for penner, blyanter eller en mike. Romslig, doble, lavere lommer. Produsentnr. : 084071051BRN1SZ Laget av beste karakteren, tettvevd, 2-trådet garn, dukke alle bomull de samme tingene de gjør topp kvalitet, isolerte coveralls fra. Løsemiddel - og olje-bevis nylon tråd brukt gjennom. Alt betydelig forsterket med sømmer rullet, dobbel sydd og ferdig, alle hjørner og stress poeng bar-stiftet for styrke. Maskinen vasker og tørker uten kanter curling eller taper form. Topp kvalitet, skreddersydd, over-knærne forkle. Krok og loop lukking på halsen stroppen kan du justere bib maksimal dekning og hvor å matche bæreren s høyde. Midtstilt øverst på lommen er sydd solid til forkle slik at den kan t swing og har en egen plass for penner, blyanter eller en mike. Romslig, doble, lavere lommer.